An entire evening of fun, mysticism, and entertainment is waiting for you and your friends and family at the Impossibilities- An Evening of Magic, Mindreading, and Mayhem show! This show has two wonderful magicians that will impress and shock with their illusions and tricks. Erik Dobell and Chris Collins come together to create a spectacular show that will have the entire audience on the edge of their seats, making the impossible seem real right before your very eyes. This magical comedian has performed countless shows over a span of about twenty years and won numerous awards for the light-hearted comedy mixed with impressive magic he brings to all of his shows. Performing for a wide array of major corporate companies and comedy clubs, Chris Collins has truly made a name for himself in the world of magic and comedy. A world traveler, Erik Dobell has taken his mentalist show to countries all over the globe. With a wide array of illusions and tricks, such as bending a quarter in the palm of your hand, naming every card you are holding and thinking of, and naming one of your friends by spelling the name on your mind one letter at a time, this performer is sure to leave you speechless. 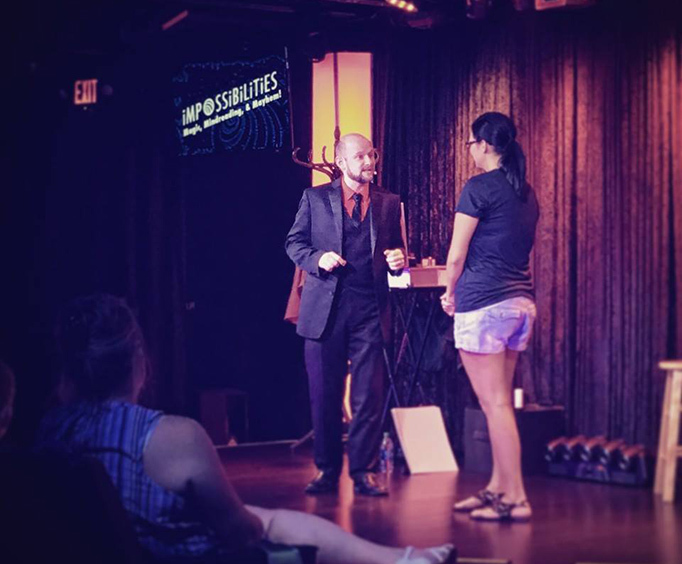 For a spectacular show and lots of laughs, be sure to check out the Impossibilities- An Evening of Magic, Mindreading, and Mayhem show today! Approximately how long is the Impossibilities - An Evening of Magic, Mindreading and Mayhem? "impressed with the things he did"
I loved the show and was impressed with the things he did in the show. You have to see them yourself. Tip: You have to go into the arcade to reach the isis theater. Makes it more exciting if you have to hunt the theater. Tip: Stay after the show and meet the mentalist. Excellent overall experience. Very friendly staff. Tickets for this show was okay. Show was great.